Every year, the Queensland Museum Network delivers an ambitious program of arts, culture and science experiences to spark challenging conversations and inspire new ideas. This program includes home-grown and international exhibitions, public lecture series and events. Lost Creatures: Stories from Ancient Queensland exhibition at Queensland Museum & Sciencentre, Brisbane. Hidden beneath Queensland’s dry river beds and in our ancient rocks are secrets from the past 250 million years. 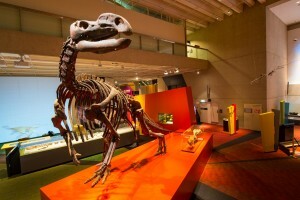 Lost Creatures: Stories from Ancient Queensland , a permanent exhibition at the Queensland Museum & Sciencentre, unravels the mysteries of ancient Queensland through the lens of extinction and evolution. An epic story of the struggle for survival in times of cataclysmic change, Lost Creatures brings ground-breaking palaeontological research to life on a grand scale through unparalleled access to fascinating fossils and cutting-edge digital technology. Lost Creatures: Stories from Ancient Queensland was funded by the Queensland Government through Arts Queensland and received support from a three-year partnership between the Queensland Museum Network and BHP Billiton Mitsui Coal (BMC). Fun in the Energy For Life Discovery Centre at Cobb+Co Museum, Toowoomba.Cobb+Co Museum's Energy for Life Discovery Centre is an interactive science exhibition explores the ways we create, use and store energy. Through hands-on activities designed to expend energy, the Energy for Life Discovery Centre encourages visitors to develop an appreciation of this finite resource, by physically feeling and seeing how much energy is consumed to power everyday devices, and considering ways we can use energy more sustainably. Exhibition themes and activities link directly to the National Curriculum and promote a range of science-related careers through profiles of real people working for Energex, Ergon Energy and Powerlink. 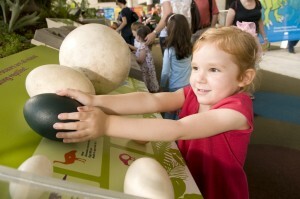 Hands-on learning in Energex Playasaurus Place at Queensland Museum & Sciencentre. Through an innovative partnership with Queensland Museum Foundation, Energex has found a unique way to educate and empowering Queenslanders to make smart energy choices that will preserve our fragile natural environment through Energex Playasaurus Place, an interactive outdoor exhibition at Queensland Museum. Packed with interactive learning opportunities, Energex Playasaurus Place is a popular space for visitors to rest, refuel or burn off some energy. Visitors are encouraged to solve problems and make conscious choices about their personal energy use under the watchful eyes of TRex and Triceratops. In 2011 and 2012 our partnership was honoured with a Creative Partnerships Award (formerly AbaF Awards) in the Visy Arts and Environmental category of the acknowledging best-practice partnerships between business and arts organisations contributing to environmental sustainability. 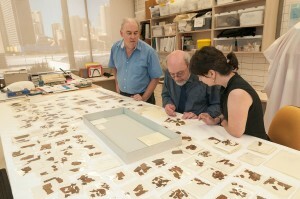 A chance discovery of Book of the Dead fragments within the State Collection led to an international collaboration. Mummy: Secrets of the Tomb was, at the time, the most successful temporary exhibition in the history of the Queensland Museum Network. Shown exclusively at the Queensland Museum from 19 April - 21 October 2013 thanks to presenting partner Tourism and Events Queensland, principal partner BOQ and media partner Channel 9, Mummy: Secrets of the Tomb was a combined 3D film and exhibition experience of priceless ancient Egyptian antiquities from the British Museum. Over the course of its 185 day exhibition tour, Mummy: Secrets of the Tomb welcomed 207,399 visitors, generating 51,782 visitor nights and $5.84 million in direct and incremental spending across the state. The fascinating, chance discovery of missing Book of the Dead fragments within the State Collection piqued global media interest leading to research collaboration opportunities with six international institutions.